Poll: How Many Entries Did You Have for NHC '12? Like all our prior poll posts, this post takes a moment to memorialize the results we recieved on the most recent blog poll. 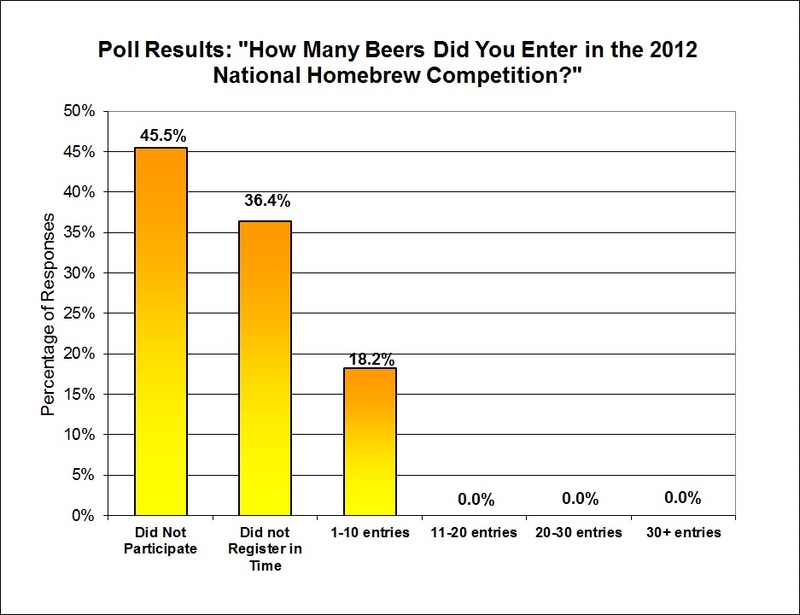 The readers' responses to the question " How many entries did you place in the 2012 National Homebrewing Competition?" are presented below. 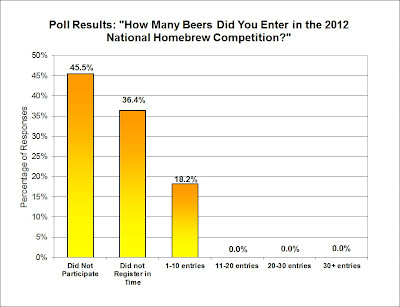 As much as I am a supporter of the National Homebrewing Competition, I am certainly not much of a participant. In the last 3-4 years, I believe I have sent in only one entry to be included in the first round judging. My interest always seems to be after the fact: prior to the deadline, I find myself too distracted to get together the registration and entry. After the first round results have been released, my interest level skyrockets, but at that point, all I can do is kick myself and mumble "next year....next year". What I found compelling about this month's poll is that it looks like I am not alone. Taking aside those that made the choice not to participate, nearly twice as many folks have an interest in the competition but just can't seem to get their regstration/entries in on time. Why is that? Is it just the procrastinator in all of us, or something else? With regards to the large population that do not participate in NHC, I'm sure there is a multitude of reasons behind their motivations. Many people are not into "style-based" competitions and would rather brew unabashed by the constraints of styles. Kudos to you folks. Others, I am sure, believe the NHC is too large of a venue and wonder why bother. With ~750 entries in each region, its too easy to get lossed in the crowd. Let us know what you think, or if you did particpate in NHC, how were your first round results? And if you are reading this, our next blog poll is up and awaiting your participation. Father’s Day Lambic – A New Tradition?